There might be people in this world who can read minds against their will and if that kind of person exists I am pretty sure my husband is one of them. I think this because of what happened the week I knew I'd be leaving soon, but he didn't know; I knew I needed to tell him this but I couldn't imagine any possible way to get my mouth to make those words, and since my husband can unintentionally read minds, he drank a good deal more than usual that week, jars of gin mostly, but tall beers from the deli, too. He'd walk in sipping a can hidden in a paper bag, smile like it was a joke. Borrowing its title from John Berryman's "Dream No. 29," Catherine Lacey's debut novel, Nobody is Ever Missing, is a very powerfully constructed tale of a life that caroms off the path expected by others. Initially, it can be read in two ways: a look at a life out of control, or alternately, as a journey taken by someone who feels overly constrained by what others desire from her. Ultimately, twenty-eight-year-old Elyria's voyage confounds easy expectations of either direction, as what she encounters and what washes over her are emotions and experiences that defy easy categorization. Nobody is Ever Missing begins with Elyria's planned decision to flee not just her marriage to a math professor, but from her career and previous life. At first, the reader does not understand why Elyria has booked a flight from New York City to New Zealand, but gradually over the course of 256 pages some of her backstory is revealed: she was a CBS soap opera scriptwriter; she had an adopted sister die by suicide; and there are troubles in her marriage deeper than what is initially revealed in the beginning chapters. Lacey does not divulge this information at once. Rather, she parcels it out in flashback reminisces and in brief conversations with passing strangers. For the most part, this is very effective, as it permits her to keep the narrative focus strictly on Elyria's immediate predicaments, although there are times where it would have been helpful to have had her past fleshed out a bit more in order to understand just where she was emotionally and why she kept fleeing. Nobody is Ever Missing is full of these observations. As Elyria hitchhikes across New Zealand, traveling toward the home of a one-time acquaintance who had once breezily offered her a place to stay if she ever visited, she encounters a host of characters. Some of these are described and dismissed over the course of a single paragraph, others, like Jaye and Werner, receive more attention. In these character interactions, Elyria's own character is presented as a ghostly double. Her own self-evaluations are countered by others' remarks, with short quips often serving as a unveiling of some of the mysteries behind Elyria's actions. These scenes, intriguing and powerful as they are, would not contain much force if it weren't for Lacey's skills as a stylist. Her sentences shift from languorous, meandering thoughts on the people and natural beauties around her to sudden, almost staccato dialogue bursts. This creates an interesting narrative rhythm in which pages of observational detail are punctuated with these sharp comments that break up lulls in the action. The result is a narrative that rarely loses its focus and manages to balance adroitly between self-reflection and narrative development. 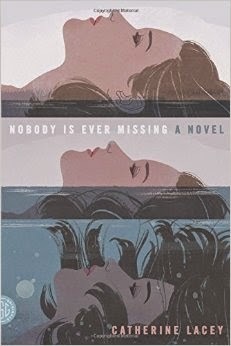 Nobody is Ever Missing is one of the better debuts I've read this year precisely because Lacey has managed to construct a nearly-perfect narrative style to suit the complex, conflicted character she's exploring. The conclusion is at once surprising and fitting. The journey Elyria and the reader have undergone has left both in a different emotional place from whence they had set out.